If you can’t stop crying after your friend sent you the cutest video of a baby kitten, if getting cut off on the freeway has you in a fury for hours, and if your desire for sweets and salty treats is insatiable, it might be Dragon Time. That’s right. Our inner dragons are powerful creatures ready to breathe fire if provoked. Don’t mess with us. When monthly moodiness hits—whatever name you may call it—there’s a temptation to run from it or hide in cave. But remember—although they may have a bad rep, dragons have a lot of powerful potential! Next time your fire flares, use these helpful tips to take control and own the dragon within! Feelings fluctuate for everyone—instigated by external circumstances and by hormonal changes. It’s okay to be sad or angry! But when your emotions start getting the best of you, there are ways to feel more centered and grounded. Add Dragon Time essential oil blend to your diffuser and take a deep breath. The proprietary blend of Fennel, Clary Sage, Marjoram, Lavender, Blue Yarrow, and Jasmine essential oils has a calming and grounding aroma. Beyond the simple enjoyment of Dragon Time’s sweet, herbaceous scent, deep breathing can help you feel more in touch with your feelings—and aware of the outside factors that might be contributing to your mood. Breathe in… and out. In… and out. It’s true. Working out might be the very last thing you want to do, but the combination of a good sweat and feel-good endorphins are the perfect partner for your dragon friend. If a heart-pumping cardio-fest isn’t in the cards, try some gentle stretching by way of light yoga. There’s more than one way to torch a calorie! Try these helpful tips for putting fun into fitness! Feed. Me. Chocolate! Or perhaps your inner dragon is fueled by more savory snacks. Cravings are usually based in something more primal than you might think. In fact, some cravings don’t have anything to do with hunger! The desire for salty treats might indicate a mineral deficiency. An intense craving for any food may be an indication of dehydration. Give your body the flavor and the nutrition it craves with recipes that are packed with good-for-you ingredients like our Blueberry-Lavender Ice Cream or No-Bake Energy Balls. Stay on top of hydration by adding a drop of your favorite Vitality oil to your water to keep you motivated to drink throughout the day. Maybe your inner dragon simply needs a soothing bath! Give the old gal a good soak and watch your bad mood go down the drain. Add a few drops of Dragon Time and Geranium essential oil to your bathwater to create a calming, soothing atmosphere. You can also make your legs silky-smooth by using this DIY shaving cream, so your body feels extra pampered when you get out of the tub. Nothing turns things around like a little massage. Gentle pressure applied to your lower back or abdomen can be calming and relaxing. Add a few drops of Dragon Time massage oil to the lower abdomen and lower back and gently massage. Wet a towel with hot water and add five drops of Dragon Time. Apply the towel to the abdomen. The heat feels relaxing and helps the aroma dissipate. 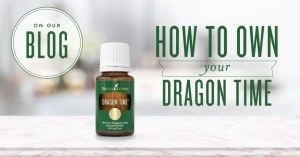 Apply 1-2 drops of Dragon Time directly to the abdomen and massage gently. Fill a rollerball applicator with Dragon Time to easily apply the oil to your abdomen and lower back for a massage. Sometimes, the dragon within us simply needs to rest. There’s nothing wrong with giving your body and mind time to rejuvenate. Try cozying up on the couch while you diffuse Dragon Time essential oil blend and let the sweet aroma create a calm, peaceful cave for everyone in your home. When things get crazy, we try to treat ourselves right—whether that’s a bit of pampering or creating a nest of cozy relaxation. Try taking care of yourself by shaping the perfect eyebrow and then creating the coziest of spots to hunker down in! What do you do to get through your Dragon Time?